The gulf between the musicals that connoisseurs love and those that people pay to see is ever widening. The rapturously beautiful The Bridges of Madison County doesn’t last half a season, while the pedestrian Beautiful – The Carol King Musical continues to play to capacity, full-price-paying houses. Roundabout’s Broadway revival of Violet got among the best reviews of the season, but was consistently near the bottom of weekly box office, audience capacity, and ticket price rankings. My recent listens to the studio cast recording of 110 in the Shade (recorded in 1997, released in 1999) reminded me that this chasm is not necessarily new. 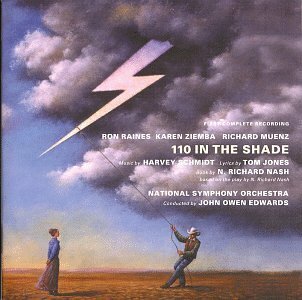 Based on an unsuccessful play (The Rainmaker) that became a popular Katherine Hepburn movie, 110 in the Shade tells the story of a plain woman who, afraid she will go unloved for the remainder of her life, meets a con-man that promises rain to her arid community (and heart) and discovers she is worthy of romance. While it’s original Broadway production was not a complete flop, running nearly a year and spawning a national tour and London production, the past fifty years have seen few professional productions with all subsequent New York appearances presented by non-profit entities (the York, New York City Opera, and most recently, Roundabout). The score by Tom Jones and Harvey Schmidt is rich and compelling enough to merit first class productions and three recordings. More expansive than the intimate scores they are better known for (The Fantasticks, I Do! I Do!) the score retains some of their trademark, quirky jazz in both music and lyrics while evoking Aaron Copeland, Richard Rogers, and even, in some of the excellent writing for the chorus, Porgy & Bess. But the beauty of songs like “Everything Beautiful Happens at Night”, “Is it Really Me” and “Old Maid” is offset by twee items like “Lizzie’s Coming Home” and “Poker Polka” (the latter’s title alone causes “drink your juice Shelby”-level eye rolling). I was mostly fond of the show when I saw Audra McDonald in Roundabout’s revival. On my first listen of this complete recording (inspired by, and featuring some of the leads from, a 1992 New York City Opera revival) I was once again struck by the score’s beauty, but grew impatient with its forced quaintness (and Karen Ziemba’s head voice) on the second go-around. Making matters worse, the thoroughly annoying “Raunchy” appears twice on the two-disk recording: Once in the original orchestration and key (which is simply too high for Ziemba), and again as a bonus track featuring a different orchestration used for the NYCO production in a more appropriate key. 110 in the Shade, Bridges…, and Violet are shows that shows that use soaring music and great theatricality to dramatize a seemingly small and personal moment of revelation and growth. If such focus and restraint in storytelling inspires great artistry, the results can be monochromatic, even gloomy–all ballads and “serious” music, with uptempo numbers often feeling forced and obligatory. If any of these shows shared The Light in the Piazza‘s warmth and humor they would have stood a better chance of sharing it’s 504 performance run. Will Fun Home, by Violet composer Jeanine Tesori, face Bridges‘ fate or share in …Piazza‘s fortune when it hits Broadway this spring? It too is centered on a personal moment of reckoning (protagonist Alison comes to terms with her father’s repressed homosexuality and suicide while also marking the process of discovering her own sexuality). But in spite of the seriousness of the subject matter, Fun Home is very funny with many moments of unabashed joy and upbeat numbers that feel integral rather than extraneous. I know I plan on making a trip to see it, but will be sure to do so early its run, lest it close before I can get there.